Triathlon may be considered an individual sport on race day, but getting to the start line doesn't have to be a solo effort. Joining a local triathlon club provides a number of benefits. Whether you're just starting out or you're a seasoned athlete, you can find a group that is right for you and your racing goals. In addition to group training opportunities, the fun and camaraderie is priceless. You will create memories and form friendships by sharing your passions with other like-minded people. If you're still not sure if joining a club is right for you, consider these five tri-club benefits. Regardless of if you're new to the sport or you've been racing for years, a local triathlon club is the perfect way to meet like-minded friends and find new training partners. You'll be amazed by how much you'll learn from others and how you'll benefit from being a part of a group. Most triathlon clubs offer group workouts along with their annual membership for little or no extra cost. Group workouts are usually motivational and fun. No one likes to suffer alone and when you're going through the same workout as your teammates, everything becomes a little easier. The time will pass faster and you'll likely push yourself harder than if you were doing it alone. Not only that, but there's an accountability factor that comes with group workouts. No one really enjoys rolling out of bed when it's dark and cold out, but you are much less likely to skip that morning workout when you know your teammates are waiting for you. Whether you have questions about gear, races or how to change your bike tire, there's always someone in a tri club who can help. 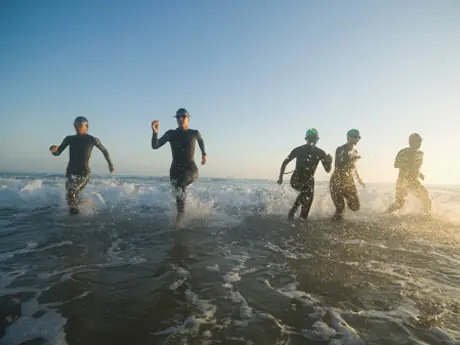 There's a lot to learn when it comes to triathlon, and the best way to get up to speed is to surround yourself with more experienced athletes. In addition, you may get a few quick pointers the next time you're in the pool or on the road. Chris Kaplanis is the co-founder and assistant head coach of Ridgewood Tri Athlete (RTA), a multisport coaching business and triathlon club in New Jersey. RTA works with athletes from across the country, offering a variety of services to get you faster, fitter and on track to successfully accomplish your goals.